Haze in Joshua Tree National Park on June 26, 2018. The park experiences almost as many smoggy days as Los Angeles. Photo courtesy NPS. Mountains. Forests. Starry nights. Smog? Sadly, yes: the air in two popular national parks in California is as dirty as it is in Los Angeles — the smoggiest city in the country. "When you think of national parks, you think of these as being really pristine areas, almost areas you want to go to get out of cities," said David Keiser, an economist at Iowa State University, who co-authored new research, published Wednesday in Science Advances. "But in many ways, the air quality conditions are just the same there as they are in cities today." From 1993 to 2014, Los Angeles racked up 2,443 days where air quality was so bad, it violated federal safety standards for smog, also called ozone. But Sequoia and Kings Canyon National Parks — a wonderland of rocky cliffs, icy cold mountain lakes and gigantic trees — had even MORE smoggy air days: 2,739. And Joshua Tree National Park was almost as bad, with 2,301 days. "It's a common misperception that because a place is labeled as a national park, there's boundaries erected around it that that prevent air pollution," said Stephanie Kodish, head of the clean air and climate program at the National Parks Conservation Association. There aren't. 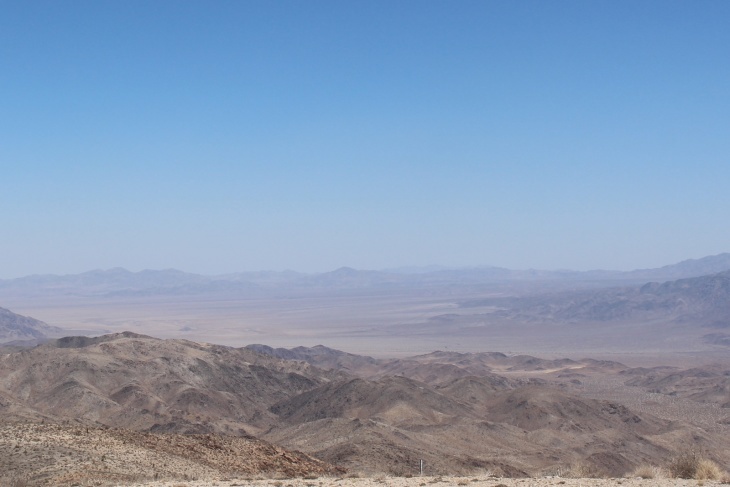 In Joshua Tree, the pollution blows in all the way from the Los Angeles Basin. In Sequoia and Kings Canyon, it comes from big farms in the central valley and cities like Bakersfield, Fresno and even the San Francisco Bay area. There, ozone is formed when sunlight bakes vehicle exhaust and other chemicals. But in cities, air quality improves overnight. It doesn't as much in nature, according to Annie Esperanza, the air resources specialist for Sequoia and Kings Canyon National Park. During the day, in urban areas, nitrogen oxide (NOx) emissions from cars and trucks help form ozone, or smog. But at night, with the absence of sunlight, NOx switches sides, and helps to break down ozone, so that in the morning, the air is cleaner. But in rural areas like national parks, there aren't as many sources of nitrogen oxide around at night to break down the ozone. That's because there are fewer people driving, so the smog just lingers day and night. WILL SMOG AFFECT ME IN THE PARK? Potentially. For healthy adults, breathing high levels of ozone can make it hard to breathe, cause wheezing or respiratory infections. One study found that breathing smoggy air for a day or two increased the risk of heart attacks for middle-aged adults without heart disease. And many studies have found hospital visits for heart and lung problems go up on days when air pollution is bad. It's even worse for kids and elderly folks. Beyond the health effects, smoggy days in national parks are just a bummer because they make it harder to see the epic vistas you probably came there for. Esperanza says on a clear day, you should be able to see over 100 miles from an overlook on the park's steep, winding entrance road. "When visibility is obscured, you can maybe see 25 to 30 miles," she said. 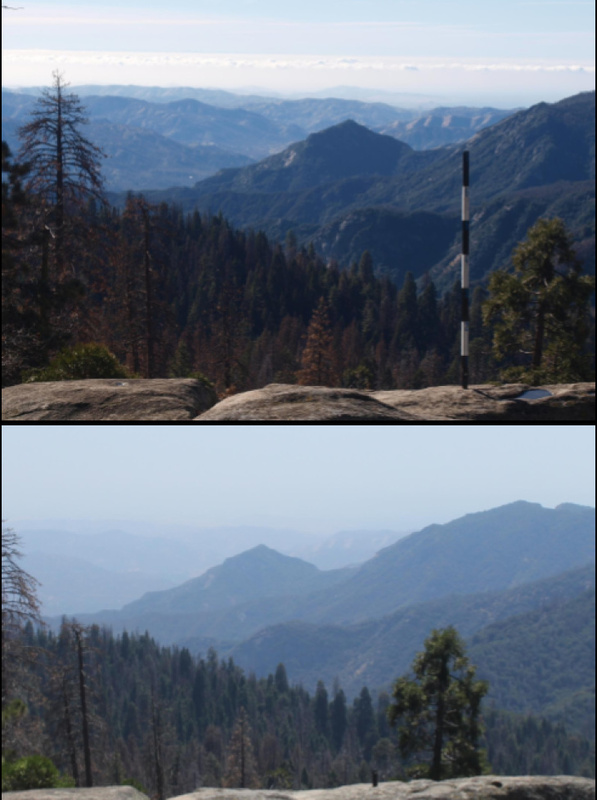 Visibility in Sequoia and Kings Canyon National Parks on a clear day (Jan. 7, 2018) compared to a hazy day (July 8, 2018). Photo courtesy NPS. The parks with the worst air quality, like Sequoia and Kings Canyon, try to warn visitors about air quality through Twitter handles like @SequoiaKingsAir. You can also check air quality beforehand here. 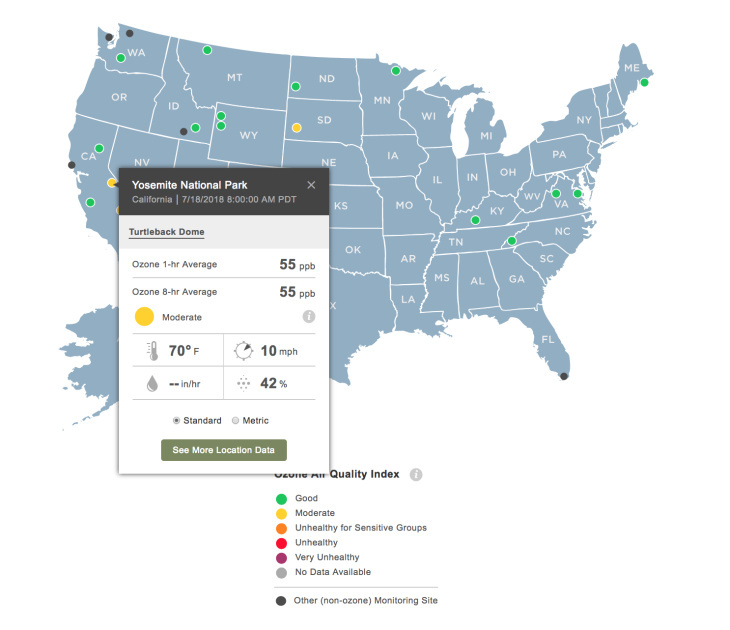 Just enter the name of the park you want to to visit, or click on it on the map, and real time air quality data will pop up. These warnings may be working, because the researchers found that fewer people visit parks on smoggy days. "It turns out a 1% increase in ozone levels results in a 1% decrease in visitation," said Keiser. IS THE AIR QUALITY GETTING BETTER IN NATIONAL PARKS, AT LEAST? Yes ... but not as quickly as in other places. Since the early 1990s, cities like L.A. have made huge gains when it comes to cleaning up the air. But air pollution in national parks remains stubbornly bad. Keiser and his co-authors found that between 1993 and 2014, the average number of bad air days in U.S. cities fell from 53 to 18 days a year (Los Angeles has far more, but this is an average of many cities). Meanwhile, the number of smoggy days in national parks didn't fall as much: from 27 in 1993 to 16 in 2014. That means as of 2014, national parks were nearly as smoggy as US cities. 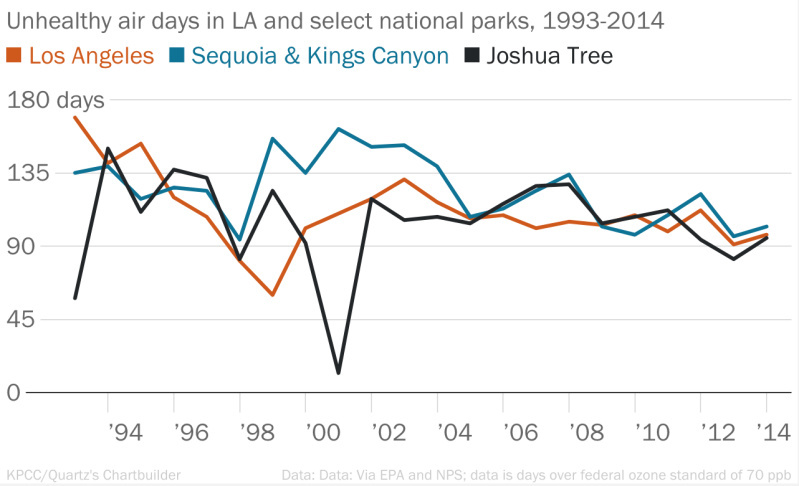 In most years, Sequoia & Kings Canyon National Park had more unhealthy air days than Los Angeles. Joshua Tree is almost as bad. Part of the reason why we haven't seen as much air quality progress in parks is that, for a long time, our regulatory agencies weren't focused on them. A 1999 EPA regulation called the Regional Haze Program requires states to clean up the air in National Parks. But it didn't take effect until 2007, so there just hasn't been as much time for things to improve. "You have a longer history of targeting sources of pollution that have an effect on public health," Kodish said. "It's more recent that there have been targeted efforts to clean up pollution that's harming parks." In other words, things that improve air quality for people living in cities — like forcing big emitters such as refineries to install modern pollution controls — may not work for the rural places where smog gets carried. The National Parks Conservation Association, in fact, just sued local and state air regulators to get them to do more to clean up air pollution in Sequoia and Kings Canyon and Yosemite national parks.